It’s hard not to view Laura’s return to the name “X-23,” after wearing the mantle of “Wolverine,” as a demotion, even a regression for the character. X-23 1 does all it can to smooth over this transition — writer Mariko Tamaki’s pitch-perfect channeling of Laura and Gabby’s voices combined with the return of one-time All-New Wolverine artist Juann Cabal gives this issue a lot of forward momentum, making it feel like a continuation of the story Tom Taylor began rather than a radically new take — but never explicitly addresses the change of code-names or the reason behind it. 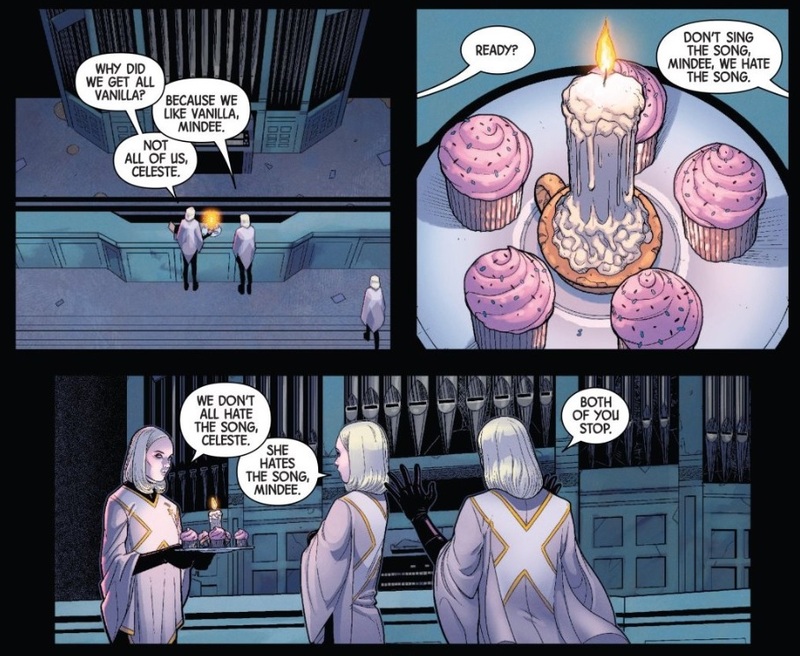 Instead, Tamaki and Cabal tackle the ideas of identity, growth, and regression head-on through the examples of Laura, Gabby, and the Stepford Cuckoos. I wouldn’t be surprised if it was all leading towards an argument for “X-23” later in the storyline. In the meantime, though, we’re obviously meant to see the similarities between Laura and Gabby and the Cuckoos, which Tamaki makes quite explicit not only through Laura’s internal monologue, but through their dialogue as well — they’re all clones, they’ve all lost sisters, and none of them are what their creators ever bargained for. Late in the issue, Laura actually laments the fact that she’s not unique, that she shares DNA with a veritable army of killers, and she’s not wrong there. I always viewed Laura taking up the mantle of Wolverine as growth and progression, but one could feasibly make the argument that it was actually the opposite, that it was Laura embracing her shared DNA and the fact that she’s a clone of Logan rather than the unique qualities she brings to the table. In X-23 1, that might just be the worst possible thing you can do. After all, it’s that kind of regression, that loss of their unique identities, that makes the Cuckoos the issue’s antagonists. The longer the characters have been around the more they’ve built unique identities, but those identities fly out the window in this issue, and that’s a planned, purposeful decision on the Cuckoos’ part. They want what they once had, not only their once-dead-now-revived-but-once-again-dying sisters Esme and Sophie, but their identical aesthetic as well. The only problem is that what once came easy to them is now forced. The Cuckoos can’t stop being unique, can’t stop having their own personalities, so they have to repress them and cater to Esme’s tastes in a vain effort to pretend that that’s what they all want. Their rejection of their individuality and the separate lives they built as they grew leads them to kidnap, to use the very experiments Laura’s devoted her life to stopping, and to reviving a sister that’s now looking to murder them all. It was clearly the wrong choice. Does that make Laura’s return to her unique identity of X-23 the right choice? I’m not necessarily convinced (if she does need to have a new identity, it shouldn’t be the name she was given by the evil men who created and de-humanized her), but I think it might be the argument this first arc of X-23 is out to make. Given the fact that Laura herself isn’t quite convinced of the power of individuality yet (she still thinks of herself as not being unique), I’m sure Tamaki realizes that she has quite a bit of work to do to get this point across, and given the wit and nuance of this issue, I very much look forward to watching her try. 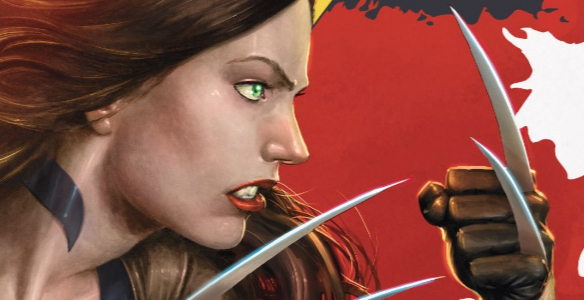 For the name change to work at all, we need to understand what “X-23” means to Laura. Your point about being Logan’s clone is well taken, but there’s no doubt that that name and costume had a lot of emotional significance to her. I’d argue that it also just asserted itself more clearly. The wolverine costume is a strong design in a way that Laura’s outfit in this issue just isn’t. Why is she wearing this? Why is she calling herself this? What does any of it mean to her? I have faith that Tamaki is going to address all of this stuff, but I didn’t expect it to bother me as much as it does. One thing that really stuck out to me was just how much the Wolverine branding is baked into this character. “Honey Badger” is a great sidekick for a character named “Wolverine,” but makes less sense for a character named “X-23.” And that’s not to mention Jonathan, their wolverine mascot. It feels a bit like if Batman changed his name to “Captain Crimefighter” but still used the “Batcave,” “Batmobile” and other Bat-branded items without any explanation. Oh, I’m not at all happy about the name change — Laura could have stayed Wolverine even IF Logan came back, we have two Hawkeyes after all — and I’m not huge on Laura’s new outfit either, but I think there’s an interesting argument for the change brewing beneath the surface of this book that I’m intrigued to see play out. Whether I’ll agree with or not I don’t know, but I think Tamaki’s building a solid foundation for her argument nonetheless. In the meantime, I love the art and think Tamaki’s doing a pretty fantastic job channeling the voices of these characters, especially Gabby, and that’s enough to keep me invested. I enjoyed this issue quite a bit, even as I pick at some of the larger building blocks of the series as a whole. Didn’t mean to suggest that you were pleased with the name change — I think we agree on all counts. It’s weird to inject such a baffling editorial choice into such an emotionally-driven series. Maybe the only thing Tamaki can really do is ignore the change. It’s unfortunate, but it won’t put me off of the series, which is already making hay with these characters. The worst thing about Laura going back to X-23 is that X-23 isn’t a name. It is a barcode. It literally means that 23rd attempt by the Facility to make a clone of Logan. There is a lot to discuss about which name best fits Laura. SHould she have her own identity, or should she have a name that connects her to family or what. But I don’t see how you can give her a name that makes her a literal product. There is a reason that in Logan, they never said X-23 (it was only shown on a test tube, i believe) once yet said X-24 many times. From a business perspective, I understand the purpose of using X-23 as that is the brand. Which is why I suggested the book should be called Laura Kinney: X-23, which reflects that conflict between her humanity and her inhuman past as someone’s product, while the comic itself would have Laura only identify as Laura. Fits the character, while preserving the branding. It would even work really well as a title for Tamaki’s approach to this series, as it puts the central dichotomy of the character right there on the title which fits Tamaki’s psychological approach to identity (yeah, Hulk made clear that she was perfect for this series, and this issue didn’t disappoint). Though that doesn’t solve the fact that Honey Badger doesn’t sound right when Laura isn’t calling herself Wolverine. And damn, I can’t believe I never thought to have the Cuckoos turn up in X-23. As the biggest fan as Kyle and Yost’s New X-Men, I have long thought of which character from that book would be be best suited to migrating to X-23’s book. I’d always said Cessily/Mercury, but damn the Stepford Cuckoos are obvious in retrospect. They are so perfect, and in true Makiko fashion, they are used in a really clever, psychological way that gets in deep to Laura’s issues. I think Makiko is really going to get into Laura’s head and create some truly fantastic stories. Also, I kind of like Laura’s new costume. I’d prefer it to be black, as black has always been Laura’s colour and feels like the one that would speak to her independence. But I think it really suits Laura, with enough touches of identity to be god for the character (especially as, lack of black aside, it does relate closely to her previously established fashion sense), while also being no nonsense enough to fit Laura, who is never a character who is going to let her combat gear have an overwhelming level of personality. And the Wolverine costumes never looked right on Laura. The blue and yellow felt wrong on her body shape (and from a pure colour theory level, are completely and utterly wrong), while the grey X-Force style was just wasted potential that didn’t suit where she should have been in her life. And there is something to say that Laura should not look like Wolverine and should establish her own identity. Oh look! Marvel hve announced an upcoming x-book #616. Wow, those “fans” are sure being oppressed….